It’s a daily ritual for many people to stick a cotton swab in each ear after showering to remove gunk and debris. But recent research suggests that most earwax is medically harmless and that you can actually do more harm than good by trying to remove it. While most of us don’t like to see or think about earwax very much, it’s important to know why it’s there and whether the amount that your ears produce is normal. Here’s some information about earwax to help you protect your ears and your hearing. The human ear canal produces cerumen, which is a waxy substance that serves as protective material. This wax protects the inner ear from dirt, dust, water-related irritations, and even microorganisms. Earwax doesn’t typically build up excessively because it is naturally washed away with good hygiene. How Much Earwax is Normal? Many people wonder whether the amount of wax that their ears produce is normal or if something should be done about it. You may notice more earwax if you wear earbud-style headphones on a regular basis or earplugs to block out noise while working or sleeping. This is because these objects prevent earwax from naturally removing itself throughout the day and night. You may have earwax buildup if the wax you see is darker in color than normal or if you feel fullness in your ear. Earwax buildup may also cause earaches, a ringing sound in the ear, or partial hearing loss. It is commonly for elderly adults to have more earwax than younger individuals, especially if they wear hearing aids. If your ears product too much earwax, it could block the passageways and make hearing more difficult. 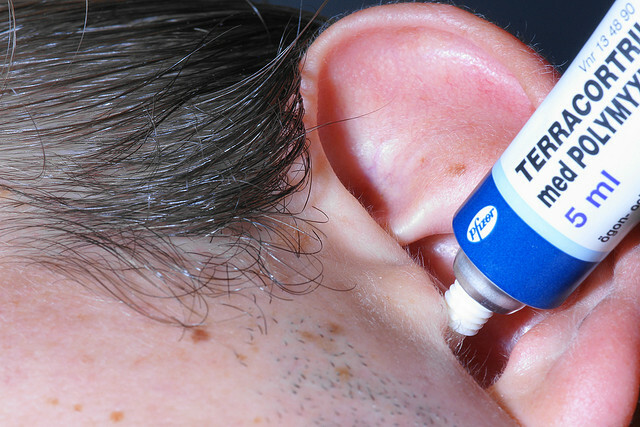 Temporary hearing loss may result if there is too much earwax buildup in one or both ears. However, this type of hearing loss is typically easy to treat and quickly reversible under the care of an experienced medical professional. If you don’t seek medical attention for a prolonged earwax buildup, you could begin to feel severe pain, experience drainage from your ear, or even notice a foul odor that comes from your ear. Dizziness, fever, and coughing may also result because of an untreated earwax issue. The trouble with cotton swabs is that they often push earwax down deeper into the ear rather than removing it. In fact, the most common cause of excessive earwax buildup is trying to remove it yourself at home. Cotton swabs should only be used on the outer portions of your ears, not actually inside the ears, for your own safety. One at-home treatment for earwax involves softening it with an over-the-counter drops or DIY recipes that contain mineral oil, hydrogen peroxide, and glycerin. A physician can perform an ear irrigation, which involves inserting warm water into the ear and then allowing it to drain out. Ear candles can be very dangerous and cause a range of issues, including punctured eardrums, burns, and household fire hazards. Most physicians say that professional earwax removal isn’t typically needed more than once per year, so that’s something to remember at your next annual physical. Between doctor visits, we recommend Seagate Earache Remedy for minor ear irritations and inflammation. This natural remedy contains six homeopathic ingredients as the active ingredients, which are Verbascum, Plantago major, Kali mur, Chamomilla, Belladonna, and Aconitum napellus in a base of Olive Leaf Extract and Grapefruit Seed Extract. Always remember to take good care of your ears by using natural products that stimulate your body’s own curative responses and seeking medical help with any health-related questions or concerns.